Ruth Meija says she was in her living room near Ann and Tropical when a car went airborne crashing into her house. Police are still looking for the driver. 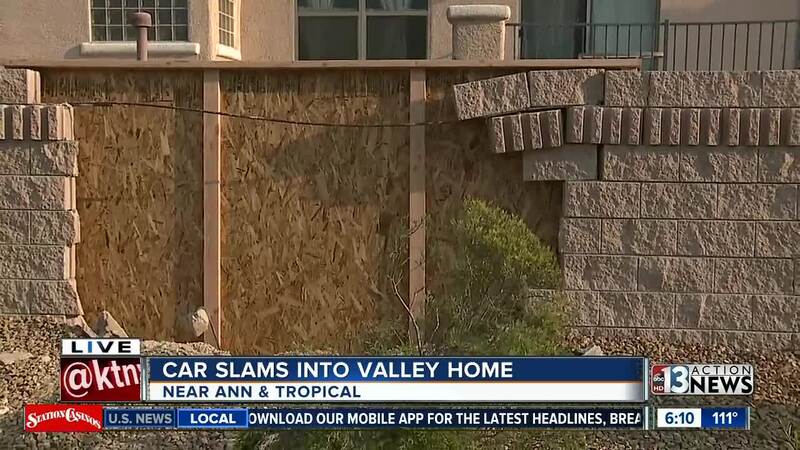 A woman says she's lucky to be alive after a car smashed into her house, knocking a cement block inches away from where she was sitting in her living room. It happened around 1:50 a.m. Thursday near Ann Road and Tropical Parkway in North Las Vegas. A car ran through McCarran Street in North Las Vegas where it ends at Tropical Parkway. At the end of the street, there is a barrier wall with a cul-de-sac behind it. That's where Ruth Mejia's home is. The car smashed through the wall and went airborne because her home is below street level. It landed after crashing through Mejia's patio. The impact was enough to cause tens of thousands of dollars in damage. Mejia and her boyfriend were up late watching TV when the crash happened. "It sound like thunder, like a bomb, I thought it was World War 3," Mejia says. She says her boyfriend overheard the people in the car say "we need to get out of here." North Las Vegas police told 13 Action News the car was not reported stolen, and they're working to track down who was driving. Meanwhile, Mejia says she was afraid the people in the car would try and break into her home. Now she says she's glad she, her boyfriend, and their dogs are OK.
"Live every day to the fullest, it could be your last," she says.